Papercrafts by Patti: PPA87 Punches! 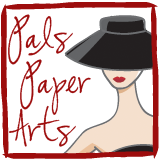 Pals Paper Arts Challenge for today is to use punches on your creation! Can you do it? Then join us!! This was a fun card to make. I love embedded embossing, which is what I did with the three rectangles. I adhered them to my Very Vanilla card stock piece, then ran it through the Big Shot in the Square Lattice Embossing Folder. The punch part of my card was to make little purses using the Round Tab punch. They are punched from pieces of Springtime Vintage designer series paper. For the handles I used the small and medium oval punches. The pretty clasps are made from the teeny butterflies from the Beautiful Wings Embosslit and they are finished off with a teeny Basic Pearl. The sentiment is stamped from Teeny Tiny Wishes onto the banner from a Petal Cone die cut in Very Vanilla. I hope you enjoyed looking at my card. Please leave your comments below--I love to read them! For all of your Stampin' Up! supplies, please use my Website to order 24/7. I've done those purses before but, yours are beautiful! 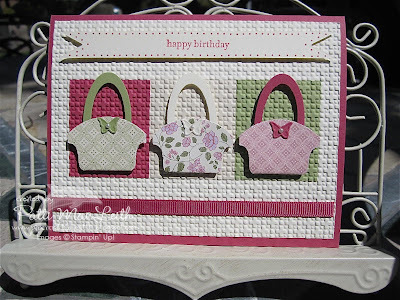 Beautiful card.Love all your details! Beautiful, Patti! These purses are just adorable! Love the texture! What a cute card! I really love the little purses and the embedded embossing. Patti, these purses are perfect! You have punched your way to perfection! This is adorable and a perfect selection of spring purses ... love it! Patti I love your little purses. I've never seen the purses with the punch using the small end 'down', but this So darling, but I can't lie. When I first them I said...... awwwww such cute little easter baskets! PS: ya know i'm making a basket in my head, right? Hugs. Love how you framed the purses! These are very cute! What a great idea for that tab punch! Love the composition too!